Sevilla impressed us all around, from its cathedral to the Barrio de Santa Cruz, but perhaps most at the Alcázar. The Alcázar is a palace originally built for local Muslim rulers in the 10th century, but then rebuilt by a Christian king in the 14th century. It is built in the “Mudéjar” style, which is Moorish style built for Christians. It contains many of the same elements of Moorish architecture (e.g. the Alhambra), but you can also see images of living creatures, which are forbidden in Islamic architecture. 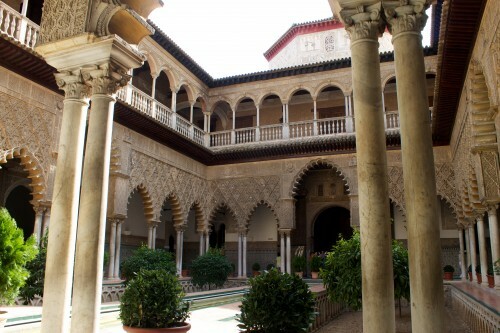 The Alcázar’s Courtyard of the Maidens (Patio de las Doncellas) is a highlight of not only Sevilla, but all of Spain. The entrance of the Alcázar looks like a medieval fortress, not that different from other old castles in Europe. After entering the fortress walls, the first destination is the Admiral’s Room, where visitors can appreciate the space where Columbus, Magellan, and other explorers planned their journeys to the new world. The real highlight is just beyond, at the Courtyard of the Maidens (pictured above). The courtyard appears to be perfectly preserved, complete with a reflecting pool and ornate Mudéjar imagery adorning arches. We took arguably our best photograph in Spain. Unlike our daytime visit to the Alhambra in Granada, we were able to appreciate the space in nearly complete solitude. In addition to the spectacular courtyard, there are also several impressive adjoining rooms, including a large banquet hall with enormous tapestries. We actually ended up spending a fair amount of time at the Alcázar’s gardens, which are both large and spectacular. The palm trees, flowers, and hedges are all meticulously maintained. There are also a number of water features to appreciate. An elevated walkway flanks one side of the garden and provides great views of the entire complex. I would not hesitate to compare the Alcázar’s gardens to those of the Alhambra’s Generalife. The Alcázar gardens include unique vegetation, water features, and an elevated walkway to appreciate the views from above. Our visit to the Alcázar was well worth the €8.50 emission. We skipped the audio guide and used the self-guided tour in our Rick Steves’ Spain guidebook, which provided just the right amount of information to digest during our visit. If you don’t have a good guidebook, it is likely worth spending the €3.60 they charge, as the Alcázar has some very interesting history. The unique architecture of the Alcázar and comparatively small crowds (we went late in the afternoon) make for a very memorable Andalusian experience. 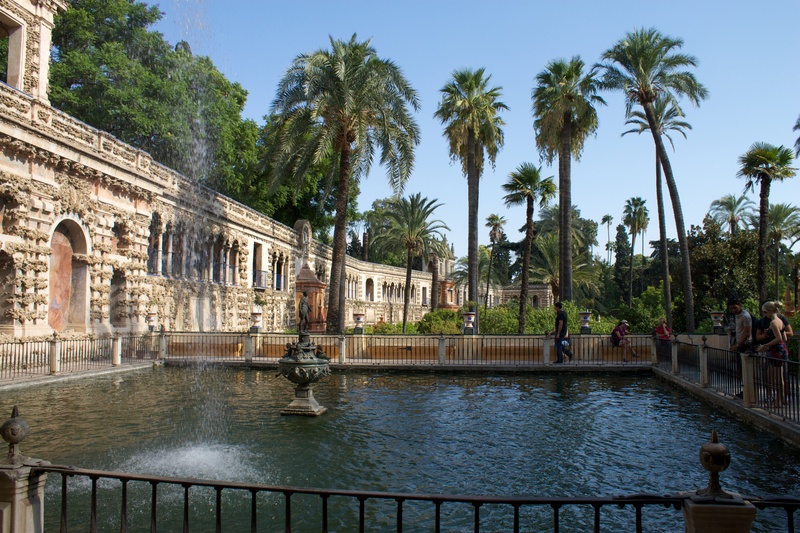 We’d certainly recommend this stop on even the shortest stopovers in Sevilla.